In 2001, German spacerock/krautrock band Vibravoid released their first album, simply titled for the year of its birth. Ten years on, the band remains prolific, with a live album coming out last year, and then a CD of new studio material in 2011 (not to mention two 7" singles, and another live album apparently on its way). Unashamedly retro in everything from album sleeves to choice of cover versions, and even paisley shirts and VU sunglasses, Vibravoid's self-proclaimed mission statement is to provide a blueprint for modern pyschedelia, "turning the clocks 40 years into the future". However, beyond inviting comparisons with their sonic forebears, their biggest challenge is how to replicate their monstrous live sound - as captured on 2010's Burg Herzberg Festival double live album, complete with incredible 40 minute version of Can's Mother Sky - in the studio. Given the studio potential for multiple overdubs vs the comparitive bare bones of a live performance, this would surely be an ironic position for a three-piece band to be in, if not for the line-up of band personal being so enignmatic (live shots appear to feature four musicians, while a publicity photo for Minddrugs shows only two, with no band credits listed). 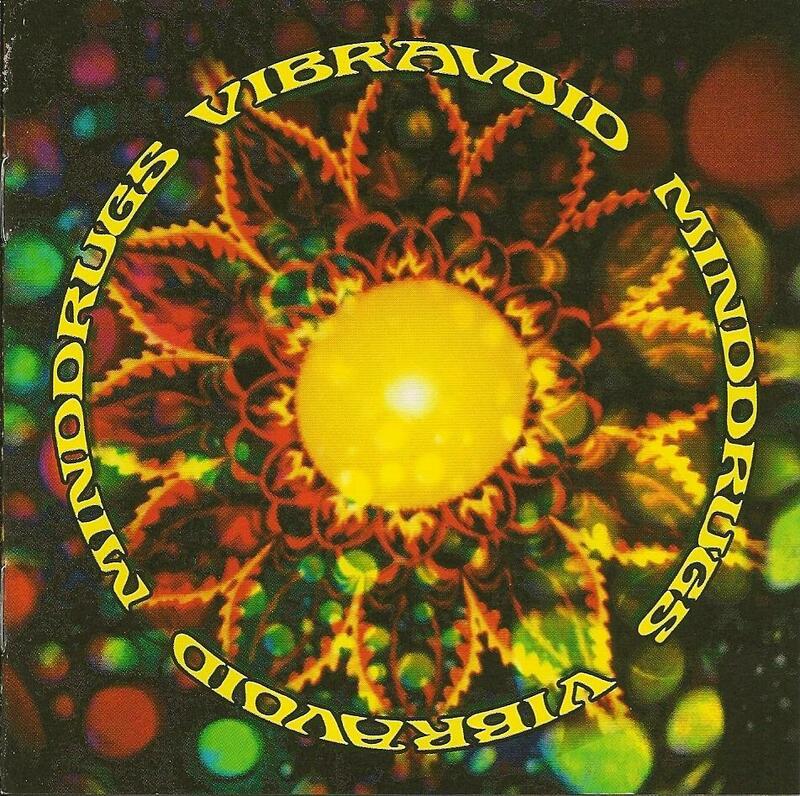 If viewed as an old-fashioned vinyl release, Minddrugs is clearly a game of two halves, the first one being heavy metronomic beats and guitar drones, and the second being based around a 22 minute cover of Pink Floyd's epic Set The Controls For The Heart Of The Sun. Opening track Seefeel smells strongly of Insence & Peppermints-style late '60's psychedelic pop (albeit in the best possible way) with echoed mantra-like vocals over chiming guitars. This is followed by twelve minutes of What You Want, seemingly based around a variation on Pink Floyd's Lucifer Sam, spaced-out (in literal and metaphorical sense) with a lengthy monoriffic and effects-laden guitar jam. Do It Alright starts with an ultra-fat bass riff, swiftly joined by wobbling synthesizers and chiming sitar-like guitars, and ending in a blast of white noise. You Keep On Falling is the last track of the album's "side one", strongly resembling the early Hawkwind live gems Do It and You Shouldn't Do That, and ending so suddenly it would appear its length was dictated by the running time of their last spool of tape. Phase two of Minddrugs opens with the sparse Lost Intensity (echoed wah-wah guitar, synths and bass runs) serving as the briefest foreword to the aforementioned Pink Floyd cover. It would be hard to imagine a version of Set The Controls being anything other than great, but here it almost sounds like the band play it too safe. The central breakdown sequence is so faithful to its Floydian orgins that it is impossible to picture it being played anywhere other than an ancient Roman ampitheatre! Only the echoed booming drums and rather cheesy air-raid siren effects provide anything really memorible beyond what Pink floyd served up in the early 1970's. In short, the only fault with Minddrugs as an album is an over reliance on formula, rather than real progression. While longtime fans will find plenty to enjoy, those wanting a first taste of the band should start with the 2010 live recording, assuming they have a spare 40 minutes and a good set of headphones.